I had a chance to visit Wes, his partner and CIO/CFO Jack Vogel, and the rest of his team recently at the Alpha Architect office in Broomall, Pennsylvania. The picturesque town is nearby Bryn Mawr, Haverford, and Swarthmore Colleges; Villanova and Drexel Universities; and The Wharton School of University of Pennsylvania. Wes earned his PhD from University of Chicago, with Nobel Prize Winner Eugene Fama serving as his adviser, and he taught at Drexel. Jack earned his PhD from Drexel and he taught at Villanova. The office is literally a converted basement in Wes’ home. Approaching the address, I observe six cars parked tightly at top of driveway, as if not wanting to call attention to the neighborhood business managing nearly $1B in assets. The headquarters of behemoth Vanguard, the industry’s largest fund provider at $5T in assets, is just 15 miles away in Valley Forge. Value Momentum Trend ETF (VMOT), May 2017. Quantitative Momentum: A Practitioner’s Guide to Building a Momentum-Based Stock Selection System, 2016. Increased assets under management (AUM) from $200M to $975M, split roughly 50/50 between ETFs and separately managed accounts (SMAs). Wes co-hosts a podcast called “Behind The Markets” with colleague, friend and neighbor Jeremy Schwartz, Director of Research for Wisdom Tree. 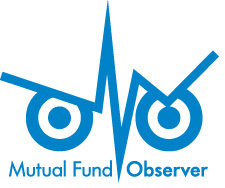 All five funds maintain a 0.79% expense ratio, including VMOT, which (after waivers) does not charge a management fee. Like QVAL, all five strategies and their employment are systematic, transparent, and based on academically vetted evidence. There is no ad-hoc decision making or active override, which is “fraught with behavioral biases.” Wes says the QVAL model has not been changed or tweaked since launch. The basic four ETFs are all concentrated, long only equity, fully invested with some 40 holdings each. 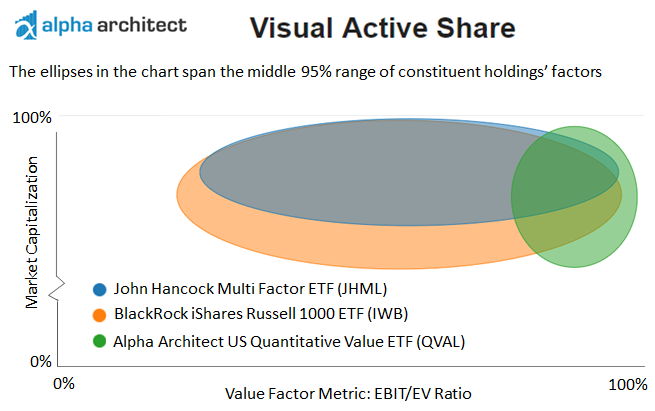 In the conference room, Wes is pulling up the Visual Active Share of John Hancock Multi Factor ETF (JHML). “What does this fact sheet say?” he asks skeptically. It states the fund will “emphasize smaller companies, lower valuations, and higher profitability.” But, in fact, “it does none of these things! And these guys are DFA, known for managing money of Nobel Prize winning economists!” The image below reveals the fund’s holdings shadow the Russell 1000 index in both capitalization and valuation, the latter based on the metric EBIT/EV or earnings before interest and taxes divided by enterprise value. Most companies that distribute funds (through online platforms, their staff of financial advisors, or both), expect to be paid by fund companies. Effectively, the fund company overcharges its customers, the distributor undercharges, then the fund company cuts a check to the distributor to settle the difference. This subterfuge rests with investors. As a general rule, they shun overt charges–brokerage commissions, account fees, and so forth. In contrast, they are relatively insensitive to asset-based arrangements, where their payments are collected quietly, behind the scenes. The artifice is a poison. It abets dishonesty. There isn’t any way that a distributor can tell its customers, “We selected these funds, in part, based on the size of the payment that we receive from their underwriters.” That is no way to inculcate trust. Open hands is where the investment business is heading, albeit slowly. Eventually, funds will be sold as stocks currently are. Investors have rewarded firms for engaging in revenue share. But those days are changing. B shares are out, and (relatively) clean ETFs are in. Gradually, slowly, revenue share is on its way to extinction. The good news is investors, particularly younger investors, are becoming more aware. Ryan calls it “the feedback loop” phenomenon. Basically, financial information is available today like never before, facilitating performance comparisons of individual portfolios, with your financial adviser or 401K plan, and those offered elsewhere. Every month, it is getting harder for financial firms to bury hidden fees in fine print of fancy factsheets and brochures. This past year through February, for example, QVAL has been exceptional. 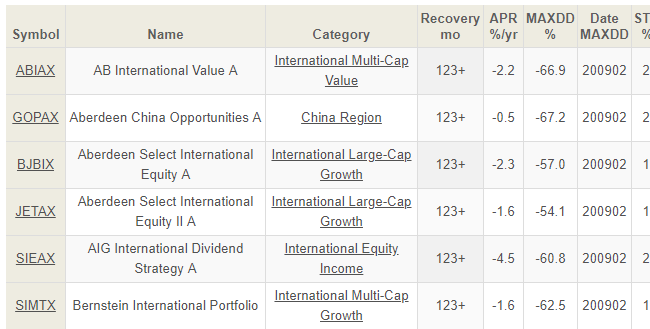 Of the 131 funds Lipper identifies in the MultiCap Value category, QVAL ranked No. 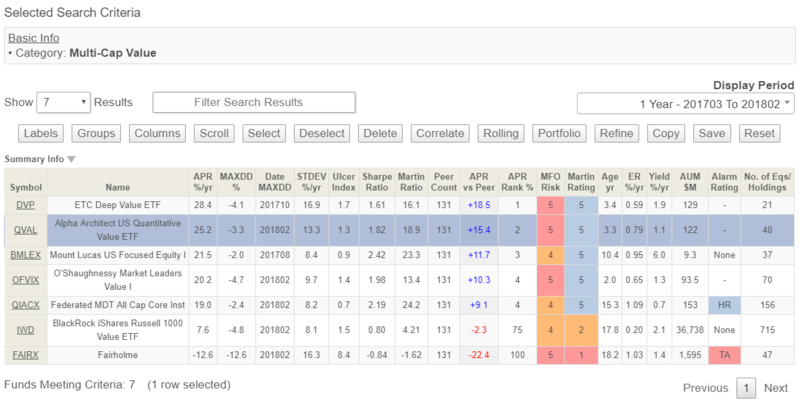 2 and it enjoyed top quintile risk-adjusted performance across multiple metrics, including Sharpe, Sortino and Martin ratios. Below, from the MFO Premium site, are the top five funds based on absolute return, along with the largest fund by AUM, BlackRock iShares Russell 1000 Value ETF (IWD), and the worst performing fund, Fairholme (FAIRX), which is actively managed by deep value investor Bruce Berkowitz … FAIRX’s 13.2% annualized 10-year return through December 2009 earned him Morningstar’s Fund Manager of the Decade award for domestic equity (click table to enlarge). Finally, below is the 1-year rolling average performance of QVAL and IVAL over the past 3 years, along with IWD and BlackRock iShares Core MSCI Total International Stock ETF (IXUS) for comparison. There are 25 1-year rolling periods and the table shows the minimum, maximum, average, and standard deviation in absolute annualized return percentage. Despite some healthy drawdown, both funds have enjoyed even healthier upside, but you must be able to handle substantially higher year-to-year variation than the market (click table to enlarge). What was supposed to be a 2-hour visit tops, turned into three days thanks in part due to Wes’ invitation to the Democratize Quant hosted by Alpha Architect and Villanova University, and in part due to a late nor’easter that dropped 13 inches of spring snow … it provided a good excuse to stay present. Many participants could not attend in person (eg., Jeremy Siegel Skyped-in from Toronto after his flight was cancelled … for a delightful “fireside chat” with his former student Jeremy Schwartz). But Bloomberg’s Eric Balchunas attended, giving his usual outstanding overview of “The ETF Landscape,” as did Barry Ritholtz, Corey Hoffstein of Newfound, Liqian Ren of Vanguard’s Quantitative Equity Group, Bridgeway’s CEO Tammira Philippe, and Chris Meredith of O’Shaughnessy Asset Management. The conference represented a sort of touchstone to the practitioners and investors in quantitative financial analysis, particularly factor based, which has become the new active, supplanting traditional fundamental, boots-on-ground strategies practiced by the likes of Benjamin Graham, Warren Buffett, Peter Lynch and Bruce Berkowitz. Similar to when Buffett was feared to have lost his touch heading into the late ‘90s, or Dodge & Cox in 2008, or Sequoia Fund (SEQUX) in 2016 … once considered the greatest fund ever, my sense is that many of the attendees at this conference, at some level, needed to be reassured as to “Why Do These Strategies ‘Work’ In The First Place?” The team at Alpha Architect will never stop asking. I’ve thought long and hard to create a portfolio that allows me to be dumb and lazy. My overarching goal is to have a portfolio that lets me get on with life, not one that consumes my life. I try to make good decisions, then not second-guess myself. The results of those impulses are below. I’ll work through my non-retirement and retirement portfolios, let you know what I’m planning and suggest a few things that you might consider doing in the months ahead. My asset allocation is driven by two insights: (1) I don’t like losing money and (2) the best way to make money in the long term is not losing in the short-term. As a result, I built my portfolio backward from the desire for enough decent returns without attention-grabbing volatility. Mostly, I’ve succeeded. From January 26 – February 8, 2018, the US stock market dropped about 10% and financial journalists dropped a couple extra shots of espresso into their morning coffee before taking up the “the end is nigh” screed. I have no idea of how my portfolio did during those couple weeks and, until I began writing this essay, I didn’t exactly know how it had performed in 2017. Nothing weird was happening with my funds, no one resigned, no one made headlines, no one liquidated … which was all I needed to know. The process I rely on is simple. Start with an appropriate asset allocation. I’ve written, repeatedly, about the fact that a stock-light portfolio is a far better choice in a non-retirement portfolio (i.e., one where you might reasonably need to make withdrawals this year or sometime in the next three or five years) than a stock-rich portfolio. For the sake of simplicity, I generally target 50% growth and 50% income. Within the growth sleeve, I generally target 50% foreign and 50% domestic. Within the income sleeve, I generally target 50% cash substitutes and 50% other. Based on a review of 65 years of returns (1949-2013), this allocation would typically return a bit over 8% annually, would lose money about one year in six but its average loss would be in the 4-5% range. Find the funds that best suit my plan and me. In general, the research shows that value works, small works, cheap works, and diversified works. 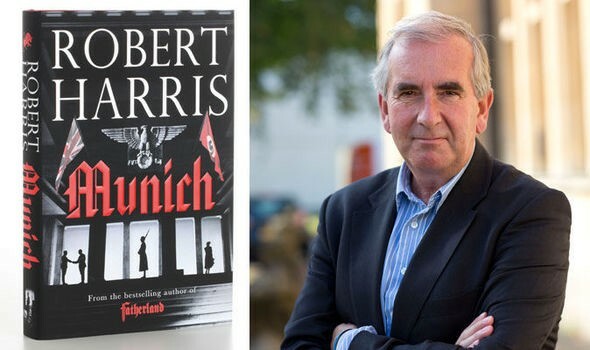 For me, in particular, I’m happiest when I become convinced that my managers are sensible people, with sensible approaches to risk, who are doing sensible things and have been through ugly markets before. That leads me toward value and absolute value managers who write well, have a willingness to close their funds early and have a long record. In general, I prefer funds where the manager is not locked into a single narrow asset class; multi-asset flexibility and a willingness to hold a lot of cash means they can be positioned to cope with the inevitable crash. Automatically invest. I don’t trust myself to write checks to investment companies, there’s always something more tempting to do with the money. So everything I do, I do with a monthly automatic investing plan. Enjoy life, seek challenges, make a difference, ignore my portfolio. The fact that two of my funds returned more than 30% last year is great, but it didn’t make the “top 10 in 2017” list in our Christmas letter: Chip’s decision to move to Iowa (and the moving adventures appertaining thereunto), my sister’s first visit in 20 years, Will’s show choir triumphs, our new rain garden and garden sculptures did. If, in 2018, two of my funds decline by 30%, it’s still not defining my year. Here’s a quick snapshot of my team, listed from my largest position to my smallest. 2017 return is just that. Worst-ever rolling measures the greatest loss you would have ever suffered if you held a fund for three years. We’re showing the “since inception” record, which means some funds have vastly more datapoints than others. FPACX, MASCX and RPSIX all have over 250 rolling three-year periods, RSIVX and GPROX have under 25. Morningstar risk is their proprietary, peer-based calculation. MFO status notes whether a fund qualifies as a Great Owl, the designation reserved for funds in the top 20% of risk-adjusted returns for every trailing period we measure. Morningstar’s take includes two reports, current as of 3/31/2018. 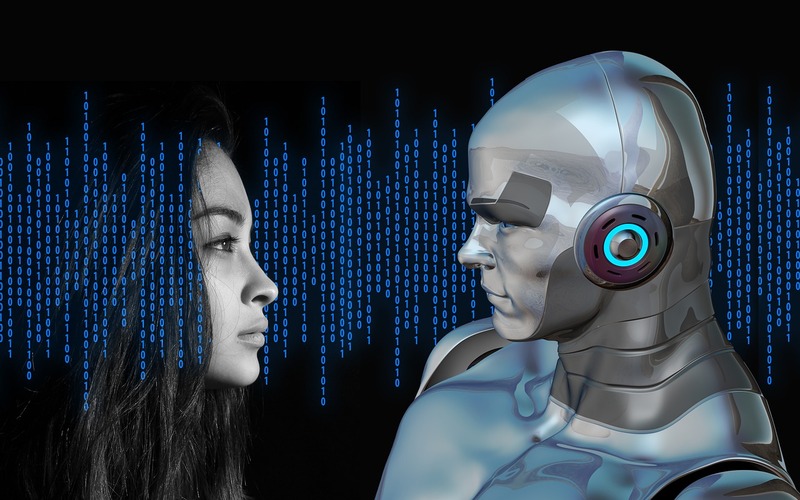 The first is the analyst rating, their forward-looking estimation of a fund’s prospects made either by their analysts (“Silver”) or by their new artificial intelligence engine (“Q-Silver”). The other is their backward-looking (but famous) star rating. FPA Crescent (FPACX): manager Steve Romick has jokingly described himself as the free-range chicken of the investing world. Romick combines the absolute value discipline that infuses the FPA operation with the willingness to invest in any part of an attractive firm’s capital structure: common or hybrid equity, debt, loans or whatever. Seafarer Growth & Income (SIGIX, closed): manager Andrew Foster just strikes me as one of the best folks I’ve met. There are lots of smart people I’ve met in the industry, but few truly thoughtful ones. In founding Seafarer, Mr. Foster announced the goal of creating a new kind of fund advisor, one smarter and more shareholder centered. He’s achieved it, through really good writing, steadily falling expenses, and an institutional share class (he’d prefer the term “universal share class”) open to small investors like me. His discipline focuses on avoiding the errors made by index creators and focusing on well-run businesses that don’t have to rely on dysfunctional local capital markets to sustain themselves. For well more than a decade, he’s practiced the art of losing at exactly the right time: his funds tend to have weak relative returns in frothy markets but excellent absolute returns. 2017 is an illustration: he trailed 86% of his peers, but made 26% for his shareholders. In a down year like 2015, he finished in the top 3% of all emerging markets funds. That’s pretty common for him. T. Rowe Price Spectrum Income (RPSIX): this is a fund of T Rowe Price funds, including one equity fund. It returns about 6-7% annually and its losing years are rare (three in 27 years) and manageable (it dropped 9% during the 2008 meltdown). The fund has been around for 298 rolling three-year periods; its worst ever three year performance was an annualized loss of 0.5% while its average gain is 7%. Income-oriented strategies are, by nature, not tax-efficient. That simply doesn’t bother me here. I’m more than happy to pay my taxes in trade for strong, reliable returns in a portfolio I can easily access. Intrepid Endurance (ICMAX): this fund pursues the industry’s rarest, hardest discipline. It’s a stock fund that refuses to buy irrationally-priced stocks. When its entire investable universe (small cap value, mostly) becomes irrationally-priced, it simply accumulates cash in anticipation of an eventual fire sale. That makes a world of sense to me: step one, don’t be stupid. Unfortunately, investors become hypnotized by the magic of stock markets that are going to go up forever, this time, and flee from their best hope of profiting from an eventual crash. (Mostly investors fantasize that, as soon as the market begins crashing, they’re going to invest every spare penny in it and make a killing; in reality, they do the opposite.) ICMAX sits at about 60% cash and trails nearly all of its peers over the past five years, with an annual return of 2%. Since I know that markets don’t go up forever and I believe this is one of the most grievously overvalued in history, I’m perfectly comfortable letting an experienced, talented manager hedge my portfolio by holding cash and waiting. Artisan International Value (ARTKX, closed): I bought this fund as soon as it launched in late 2002. The managers are interested in building a compact, 50 stock portfolio of high quality, undervalued firms, frequently with much lower than average market caps. The fund’s performance has clubbed its peers and pretty much every plausible benchmark over the past 15 years. As undervalued stocks become rare, the managers have moved into larger firms and are holding a lot (15%) of cash. The fund closed to new investors to minimize the risk of bloat and my only concern is that Messrs. Samra and O’Keefe might choose to cash in their chips and retire to a nice chateau, as some other early Artisan managers have already chosen to do. As long as they stay, so do I.
RiverPark Strategic Income (RSIVX) and RiverPark Short Term High Yield (RPHYX): both RiverPark funds are run by David Sherman of Cohanzick Asset Management. The older fund, RPHYX, has been freakishly successful as a cash alternative fund for me: it has averaged 3.2% annually since inception with a negative downside capture rate. Right, markets fall and it makes money. The fund has been around for 78 rolling 12-month periods; so far, its worst-ever loss in a 12 month period was a gain of 0.6%. In consequence, it has the highest five-year Sharpe ratio of any fund in existence. Strategic Income was positioned as one step further out on the risk-return ladder. Over the past three years it has returned about 50% more than its sibling, but with substantially greater volatility. At base, a couple individual issues blew up in 2014; with a concentrated portfolio, that was enough to put a noticeable dent in the fund. I’m strongly committed to RPHYX, but likely to remain vigilant about Mr. Sherman’s ability to avoid repeating errors of the magnitude we saw in RSIVX’s portfolio in 2014. Matthews Asia Strategic Income (MAINX): the argument is that the center of the financial world is ineluctably shifting from places like New York and London to places like Shanghai, and that wise income investors need to accommodate their portfolios to that shift. The fund can go anywhere within the Asian income market, including corporate (currently 50%) and government bonds, convertibles and dividend-paying stocks. The fund, led by Teresa Kong, has been growing slowly and is miscategorized by Morningstar as a “world bond” fund. The decision is entirely understandable, but it also means that star ratings and comparisons to “peer” performance as quite unreliable. Grandeur Peak Global Reach (GPROX, closed) and Global Micro Cap (GPMCX, closed): the folks at Grandeur Peak are better at small- and micro-cap global investing than anyone else. Full stop. The founders left Wasatch after a strong run there and formed a new firm obsessive about getting investing right. They knew from the outset that they’d eventually launch seven core funds, they knew what their firm-wide capacity was and they resolved to close each fund promptly and tightly. And they have: all seven Grandeur Peak funds are now closed to new investors, including the $42 million micro cap fund that was closed on the day it opened, though their two “alumni” funds, Global Stalwarts and International Stalwarts, were opened to give loyal advisors access to the Grandeur Peak discipline in slightly larger firms. Over the years, there’s need a steady stream of folks looking to align with the firm. My final question is whether each of my funds brings something distinct to my portfolio. It wouldn’t make sense to have two funds each trying to do the same thing; I’d want to simply get rid of the weaker of the two and keep the stronger. We assess that by generating a correlation matrix, using the tools at MFO Premium. In general, I’d worry about correlations in the 90s, notice correlations in the 80s and be pleased with correlations in the 70s and below. Grandeur Peak Global Micro Cap is too young to appear in any of the following analyses. It’s rare that I hold a fund for less than 7-10 years, mostly because I know that change is rarely warranted if you’ve done the homework and the manager has kept the faith. Three things weigh on my mind as I think about my portfolio following this review. I’m out of balance. The stock/bond balance is just fine at 51% – 49%. Within stocks, though, the domestic/international balance is badly off-course. It should be 50% domestic, 50% international. It’s closer to 28% domestic, 72% international. That’s the biggest imbalance ever in my portfolio. It reflects two sets of decisions: my decision not to have a “pure” domestic equity fund and my managers’ decision, wherever possible, to underweight domestic equity because valuations are so badly stretched. Two options: let it ride for another year or add a fund with strong exposure to domestic equity. Here is GMO’s February 2018 forecast for equity class returns over the next seven years. It’s created by simply modeling what would happen if valuations and profits regressed to roughly their historic means. From a valuation perspective, (a) things look bleak but (b) my preference for emerging markets exposure and cash-like investments – a sort of barbell – is looking more justified than forcing exposure to US equities. I need to reconsider MACSX. The correlation with Seafarer, which has Mr. Foster and more global flexibility, is high enough to warrant eliminating it. I could add a fund with greater domestic equity, I suppose, or shift the money to Matthews Strategic Income. Ms. Kong’s fund has, since inception, had a fair correlation (low 80s) with MACSX, offered higher returns (4% versus 3% over 5 years) and far lower volatility (5.2% SD versus 10.3%). I need to step up my monthly investment. My broker has been Scottrade, recently absorbed by TD Ameritrade. There was an administrative screw-up (uhhh … miscommunication, I’m told) that discontinued my monthly transfer from my bank account a year or so ago. 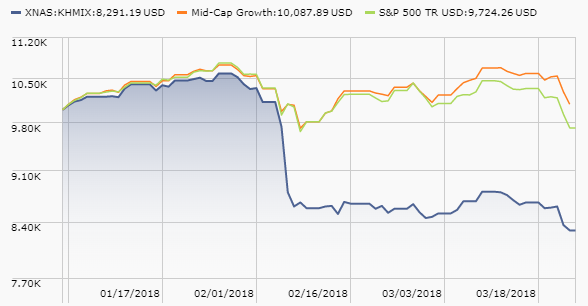 While I’m adding steadily to my non-retirement portfolio through auto-investing in Seafarer, T Rowe Price and Grandeur Peak, the amount should probably rise at least a bit from my current level of several hundred a month. My retirement portfolio consists of a 403(b) plan administered by my employer, Augustana College, and a small Roth IRA. The 403(b) part is split between TIAA-CREF (the college’s contribution went there), T. Rowe Price and Fidelity. As part of a retirement plan reform that I helped manage, we’ve effectively shut down my ability to add to the Fidelity or T Rowe portfolios. Our new state-of-the-art system offers fewer choices (CREF funds and accounts, lifecycle funds as a default, and exactly one actively managed outside fund in each asset class) but has vastly higher employee participation. I really wanted to keep my old setup, but knew that it wasn’t in the best interest of the vast majority of college employees. Each of the three providers has a stand-alone portfolio that’s about 70% equities. The relentless rise of the US stock market and the inconvenience of managing the old accounts through the new system, has allowed my domestic equity exposure to get far too high at about 50% more than international equity. That said, the returns were just fine last year – 23% or so – driven by all things growth. Expenses across the portfolio come to 0.55%. Three changes are coming in the near future. I am liquidating my Fidelity portfolio and transferring the proceeds to T. Rowe Price. I’m worried that Fidelity is becoming a bit frayed, with reports of sexual harassment, changes in the roles of managers, fund mergers and no clear evidence of a healthy, innovative culture. For the sake of sanity and simplicity, I’d rather one “locked” portfolio than two and I am substantially more confident in Price than in Fido. I will simplify things at Price. My plan is to maintain my overweights (small / value / emerging) but I’ll do it with fewer funds. I’m apt to move the bulk of my assets into T Rowe Price Retirement 2025 (TRRHX) then use smaller positions in a few funds to tilt it. Price also has a Target 2025 Fund (TRRVX) with the same manager but a more cautious asset allocation. I’ll ponder it, but lean toward the other. I will review my asset allocation. I’m not sure that I want to ratchet back. As little as possible, but as much as necessary. Consider contributing, then using the ever-evolving tools at MFO Premium. The contribution part is $100 a year, tax-deductible (mostly). The tools are easy to use and Charles, our colleague and maestro of the Premium site, is an infinitely kind and engaging teacher for those who have questions. Consider whether you’re comfortable with the risks you’ve built into your portfolio. 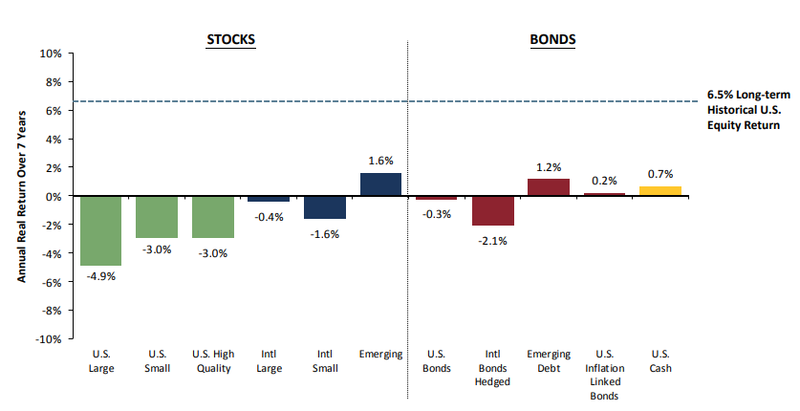 You might glance at our 2014 and 2017 articles (here, here, and here) on the implications of asset allocation for risk and return, to see whether you’re aware of the broad risks you face. You might try the lifeboat drill we offered: multiply your funds’ maximum drawdown during the 2007-09 financial crisis by their percentage weight in your portfolio. The result will give you a decent guesstimate of how much your portfolio might fall in a similar meltdown. In my case, the non-retirement loss would likely be in the low 20s. If you look and think, “good gravy, I wouldn’t be able to sleep or eat if I lost that much,” you could act to change your risk profile now by shifting to a lower risk allocation or to more risk-sensitive managers. What comes next? Stocks are still overvalued by most measures. And bonds, given an upward trend in interest rates, with the Federal Reserve committed to more hikes, don’t offer a place to hide. According to my friend Larry Jeddeloh at The Institutional Strategist, tech valuations look to be close to where they were in 2000 before the dot.com implosion, which was triggered by an absence of liquidity in the U.S. banking system. So once again we may get to see whether valuations and liquidity have an impact on technology businesses. The question now arises as to how we pay the increased rates on our debt if the Fed keeps raising rates. (Per the Committee for a Responsible Federal Budget, “if interest rates were 1 percentage point higher than expected, debt would rise by $1.7 trillion over ten years.”) The answer seems to be that we will look to inflate our way out of the increased interest payments. Friend Jeddeloh has also opined that home prices are now back to about where they were, if not below where they were, just before the beginning of the Great Recession in 2008. Since many steps have been taken to keep the banking system from getting into trouble again, this time it looks like the onus has been put on the homeowner. Namely, as rates go up (which we have seen in mortgages), the prices of homes will have to come down for there to be a clearing of the excess inventory. Alternatively, people are going to be staying in their houses a lot longer, rather than being able to sell to afford the entry deposit to the retirement community. Home price increases and home sales have come to a halt, not just in Chicago but also in New York and Boston. In that vein, I have to say that I had more reaction to my column last month about condominium prices in Chicago over the last three years than I have had in response to almost any other column I have written. It turns out that price increases and sales have come not just to a halt in Chicago, but also in New York City and Boston. That lack of sales activity has been masked to some extent because the building trades and the manufacturers and suppliers of building materials have remained quite busy. Why? One reason is the unusually large number of catastrophic storm, fire, and other losses homeowners have suffered across the country since last summer. We have had hurricanes and flooding in Texas, Florida, and Puerto Rico, along with storm damage all up the East Coast running from Florida up to Maine, and fires in California. The winter storms this year have added to the toll. So what? Well, the big homeowner’s insurance companies are first movers in that regard, as they endeavor to limit or mitigate further damage. What might have been normal building materials inventories for where we are in the real estate cycle, before the catastrophe losses, have been drawn down to effect repairs. And contractors and sub-contractors in the various trades are filling their order books with more work commitments than they can fulfill in the usual time. A person at one insurance agency that has clients at the high end of the business in those geographic areas told me, within the last two weeks, that no contractor she has been trying to hire for repair work will guarantee materials pricing out more than thirty days. And the head of personal lines at a major property and casualty company has confirmed for me that this year has started off as last year ended in terms of weather events. And this is before we understand the full effect of tariffs. And these issues are before we understand the full effect of tariffs. Last summer, the Trump Administration put a tariff on Canadian timber, which has impacted the pricing and availability of some categories of lumber. Given that we have had a long, cold winter in the northern tier of the country, it will probably also take longer for domestic loggers to get into the forests, cut new timber, and get it out and into the kilns to prepare for delivery. And that was before we have had the new wrinkle of tariffs on steel and aluminum. And to that add the uncertainty as to which countries and products those tariffs will ultimately apply (a Chicago architect mentioned to me last week that they were seeing a ripple through of pricing increases on steel in commercial projects on the order of 20%). The above provides fair warning that we are going to see conditions of extreme volatility in both new construction and repair work. There is one area that I don’t think people have considered. That is the changes in consumer thinking that will be driven by the new personal income tax changes. There are some parts of the country which in effect have two-tier residential home markets. One tier is for those who live and work in that marketplace year-round, for whom it is home. The other tier in that market is the second home owner, who comes to the area on weekends and holidays as well as for extended periods of time during the year, either in the summer to enjoy the weather and access to water sports and boating among things, or in the winter for winter sports. Some of the obvious locations are Santa Fe, New Mexico; parts of Colorado and Montana, and much of the coastal areas of the East Coast. Two areas that I am familiar with that fall into that category are Litchfield County in northwest Connecticut and southern Berkshire County in western Massachusetts. For those locations, the second tier of homes are those whose market values/selling prices are usually greater than $750,000 and rising on up to the $2 or $3M range. Most people in that category of homeowner in those two counties come up from New York City, which is generally a two to three hour drive or drive plus train trip, to spend at least three weekends of every month in that second home. What has changed? Well, the amount of subsidy by the Federal tax act has changed. State and local deductibility of taxes is now capped at $10,000 so deducting all your New York City property taxes and all your Massachusetts property taxes is gone. In fact, you will most likely be unable to deduct most of your New York State and City income taxes, and your property taxes in New York. The deductibility of first or second home mortgages above $750,000 is also gone. My sense is that when this year’s tax return is received and the estimates for the coming year are also received, there is going to be a very rude awakening. And to me that translates to the incremental demand coming from people looking for that kind of weekend property drying up, UNTIL the clearing prices of the existing inventory of those homes for sale above $750,000 comes down to where people think they are getting a real bargain. There will be another tangential effect, detrimental to those second home communities. And that is that the boost to revenues they have gotten from increased property taxes in a rising price property market will be on hold, putting pressure on municipal budgets. They will have to cut services, raise the rate of property taxes, and add new fees on other services, or some combination of all three. On that cheerful note, I am going to end, as far as the meat of this letter is concerned. Morningstar’s analysts can cover a limited number of funds, “those investments that are most relevant to investors and that hold a significant portion of industry assets.” When analysts cover a fund, they issue a forward-looking rating based on five research-driven “pillars.” Those ratings are described by medal assignments: Gold, Silver, Bronze, Neutral and Negative. The analyst ratings are distinct from the iconic star ratings; the star ratings are backward looking (they tell you how a fund did based on risk and return measures) while the analyst ratings are forward-looking (they aspire to tell you how a fund will do based on a broader set of factors). As a practical matter, few smaller, newer, independent funds qualify. In response to concerns from clients who believe that Morningstar’s assessment is an important part of their compliance and due-diligence efforts for every fund they consider, Morningstar has unveiled a second tier of ratings. These ratings are driven by a machine-learning algorithm that has been studying two sets of data: the last five years’ worth of analyst ratings and the ocean of data Morningstar has on the components and metrics of fund performance. The goal was to produce ratings for all “analogous to” those produced by Morningstar analysts. Like the analyst ratings, they would could in Gold/Silver/Bronze and so on. Unlike the analyst ratings, they would be based purely on quantitative inputs (so the observation “he’s an utter sleazeball and a lying sack of poop” might influence the analyst’s judgment but would be unavailable to the machine). Here are the methodological details. On March 28, 2018, I had to chance to speak with Jeff Ptak and Tim Strauts about the system and its implications. Jeff is Morningstar’s global director of manager research, Tim is their director of quantitative research and one of the brains behind the new system. We played around with three topics. Performance in the back tests, they aver, “is pretty good.” The rough translation is that the machine has roughly the same level of predictive ability as do the human analysts. Does the machine get to replace the humans? Of course not. (If I had a nickel for …) The machine and the humans do not always agree, in part because they’re focused on slightly different sets of inputs. The humans factor conversations into their judgment of the “People” pillar, for instance, while the machine factors in Sharpe ratio as part of “People.” For now the machine and the humans agree on the exact rating about 80% of the time; it could be higher, but Tim argues that he didn’t want to “overfit” the model. The more important point, in their minds, is that they’re largely avoided “the very bad problem” that would result if the machine issued a “negative” rating on the same fund where the analysts assigned a positive one. That occurs in “much less” than 1% of the ratings. Beyond that, the machine learns from the analysts’ rating decisions. They need to keep making new decisions in order for it to become more sophisticated. Is there a way to see the machine’s outputs? That is, can we quickly find where the machine found bits of gold or silver that the analysts missed? Nope. Jeff and Tim are going to check with the Product team and the Prospects team, but they neither knew of any particular cool finds made by the machine nor of any way for outsiders to search the ratings just now. The ratings are available, fund by fund, on Morningstar’s new (low profile) fund pages. When you pull up a fund’s profile, you see a simple link to the alternate profile page. Out of curiosity, I ran a screen for all five-star domestic equity funds with under $1 billion in assets, then clicked through each profile. About half of the funds have a neutral rating and just two have negative ratings. Excluding a few funds available just through insurance products, here’s the list of “non-neutral” funds with the links to their MFO profiles when available. Many of these are purely institutional funds or the institutional share classes of funds, which reflects the effect of expenses on a fund’s ratings. Fuller & Thaler Behavioral Small-Cap Equity FTHFX – an MFO “Great Owl” fund. Great Owls, a term derived from the Great Horned Owl which inspired MFO’s logo, are fund’s that are in the top 20% of their peer group, based on risk-adjusted returns, for every trailing measurement period. Making 15% is good. It’s about 50% above the stock market’s historic rate of return and is a bit better than most balanced funds. Holding 15% cash is good. The stock market is teetering. Its valuations are at or near all-time highs by a variety of measures. Washington is somewhat unhinged. People, and machines, are primed for a panic. And the best way to survive a panic is to have a clear plan and cash on hand to move in when others are giving away their shares. Holding 15% cash and still finding a way to make 15% last year – that is, having both dry powder to profit in a crash while not sitting out the market’s rise – is rare, difficult and desirable. Finding such funds is tricky because “cash” has many forms and functions. For our purposes, we’re looking at “cash” as a source of liquidity: money guaranteed to be there in the midst of a crash, so that a manager might move aggressively. So we started with all funds that nominally held 15% or more in cash, then stripped out those who used cash as collateral, or those whose cash included highly volatile cryptocurrencies. As a further safeguard, we tried to strip away highly volatile funds. We also screened for trailing three year returns of at least 5% to minimize the number of one hit wonders. Finally, we tried to identify funds that were still open and accessible to the average retail investor. That left us with just over 15 15/15 funds. Investors looking for a portfolio hedge, but who aren’t immediately drawn to complicated and costly hedging strategies, might want to start here. We have never had a year below the 47th percentile over that period or, until 1990, above the 27th percentile. As a result, we are in the fourth percentile for the 14-year period as a whole. Sadly, he offers no suggestions for how to find such managers. Here’s one place to start: we searched for equity managers who had not fallen in their category’s bottom third in any of the past ten years. I focused only on funds that Morningstar flags as “core” holdings, which eliminates pretty much all of the smaller, newer funds which comprise MFO’s coverage universe. All of the funds turn out to have received four- or five-star ratings from Morningstar and are medalists of various shades. This list excluded target-date funds and those not easily accessible to small investors. If these results were merely random, we’d expect to see one-third of the list drop out each year; that is, one third of a random group of funds would end up the bottom third of their peer group. That’s not the pattern here, funds drop out at about 40% of the predicted rate. Bottom Line: It is possible to change your portfolio’s risk-return profile. It doesn’t require blowing things up, but it doesn’t benefit from blind deference to the magic of market cap-weighted index funds either. Investors who ask reasonable questions, proceed from an understanding of what risks their portfolio faces and do a little poking around while the weather’s still relatively calm, can make things better for themselves and their families. The fund seeks long term capital growth through investing in what they deem to be 30 highly innovative, reasonably valued, companies from around the globe. They take an eclectic approach to identifying global innovators. They read widely (for example Fast Company and MIT’s Technology Review, as well as reports from the Boston Consulting Group and Thomson Reuters) and maintain ongoing conversations with folks in a variety of industries. That leads them to identify a manageable set of themes (from artificial intelligence to clean energy) which seem to be driving global innovation. They then identify companies substantially exposed to those themes (about 1000), then weed out the financially challenged (taking the list down to 500). Having identified a potential addition to the portfolio, they also have to convince themselves that it has more upside than anyone currently in the portfolio (since there’s a one-in-one-out discipline) and that it’s selling at a substantial discount to fair value (typically about one standard deviation below its 10 year average). They rebalance about quarterly to maintain roughly equally weighted positions in all thirty, but the rebalance is not purely mechanical. They try to keep the weights “reasonably in line” but are aware of the importance of minimizing trading costs and tax burdens. The fund stays fully invested. Guinness Atkinson Asset Management. The firm started in 1993 as the US arm of Guinness Flight Global Asset Management and their first American funds were Guinness Flight China and Hong Kong (1994) and Asia Focus (1996). Guinness Flight was acquired by Investec, then Tim Guinness and Jim Atkinson’s acquired Investec’s US funds business to form Guinness Atkinson. Their London-based sister company is Guinness Asset Management which runs European funds that parallel the U.S. ones. They have $1.6 billion in assets under management and advises funds in both the US and Europe. Matthew Page and Ian Mortimer. Mr. Page joined GA in 2005 and working for Goldman Sachs. He earned an M.A. from Oxford in 2004. Dr. Mortimer joined GA in 2006. Prior to joining GA, he completed a doctorate in experimental physics at the University of Oxford. They are assisted by two analysts. The team manages $930 million in total, including Dividend Builder Fund (GAINX) and the Dublin-based versions of both funds. Approximately $5 billion. The current estimate of strategy capacity was generated by a simple calculation: 30 times the amount they might legally and prudently own of the smallest stock in their universe. The strategy, including its Dublin-based version, holds about $390 million. 93. “Active share” measures the degree to which a fund’s portfolio differs from the holdings of its benchmark portfolio. High active share indicates management which is providing a portfolio that is substantially different from, and independent of, the index. An active share of zero indicates perfect overlap with the index, 100 indicates perfect independence. The active share for Global Innovators is 93, which reflects a very high level of independence from its benchmark MSCI World Index. The managers are not invested in the fund because it’s only open to U.S. residents. They report being heavily invested in the European version of the strategy. Good question! The fund launched as the Wired 40 Index on December 15, 1998. It performed splendidly. It became the actively managed Global Innovators Fund on April 1, 2003 under the direction of Edmund Harriss and Tim Guinness. It performed splendidly. The current team came onboard in May 2010 (Page) and May 2011 (Mortimer) and tweaked the process, after which it again performed splendidly. $5,000, reduced to $1,000 for IRAs and just $250 for accounts established with an automatic investment plan. The minimum for the Institutional share class (GINNX) is $100,000. 1.24% on assets of about $230 million, as of March 30, 2018. Expenses on the institutional shae class is 0.99%. The fund continues to see steady inflows. Let’s start with the obvious and work backward from there. Morningstar, using a different peer group, places it in the top 1 – 5% of US Large Blend funds for the past 1, 3, 5 and 10 year periods (as of 03/29/2018). That’s particularly impressive given the fact that IWIRX is succeeding against a domestic peer group (the average peer has 3% foreign) with a portfolio is that heavily invested overseas (40%) at a time when domestic stocks (8.6% annually over the past ten years) have a strong performance advantage over their international peers (5.8% annually in the same period). They should not be thriving given those disadvantages, and yet they are. The essential point to grasp is that in dealing with capitalism we are dealing with an evolutionary process. … Capitalism, then, is by its nature a form or method of economic change and not only never is but never can be stationary. [t]he … process of industrial mutation … incessantly revolutionizes the economic structure from within, incessantly destroying the old one, incessantly creating a new one. This process of Creative Destruction is the essential fact about capitalism. It is what capitalism consists in and what every capitalist concern has got to live in. The challenge is finding such firms and resisting the temptation to overpay for them. The fund initially (1998-2003) tracked an index of 40 stocks chosen by the editors of Wired magazine “to mirror the arc of the new economy as it emerges from the heart of the late industrial age.” In 2003, Guinness concluded that a more focused portfolio and more active selection process would do better, and they were right. In 2010, the new team inherited the fund. They maintained its historic philosophy and construction but broadened its investable universe. Fifteen years ago there were only about 80 stocks that qualified for consideration; today it’s closer to 500 than their “slightly more robust identification process” has them track. This is not a collection of “story stocks.” They look for firms that are continually reinventing themselves and looking for better ways to address the opportunities and challenges in their industry and in the global economy. While that might describe Google / Alphabet, it might also describe a major manufacturer of tires (Continental AG) or an innovative conglomerate whoses businesses find new ways “diagnose, treat and prevent disease” dental diseases and finds new ways to provide clean drinking water for tens of millions of people (Danaher Corporation). The key is to find firms which will produce disproportionately high returns on invested capital in the decade ahead and which are not themselves capital intensive or deeply in debt, not stocks that everyone is talking about. Then they need to avoid overpaying for them. The managers note that many of the firms on their watchlist, their potential acquisitions, sell at “extortionate valuations.” Their strategy is to wait the required 12 – 36 months until they finally disappoint the crowd’s manic expectations. There’s a stampede for the door, the stocks overshoot – sometimes dramatically – on the downside and the guys move in. An analysis of the fund’s 2017 year-end portfolio shows the way this discipline plays out. Their firms spent a lot more on R&D than their peers (7.8% versus 6.0% of sales revenue) but a lot less (7.5% versus 9.0%) on capital goods. Their firms have a lot higher return-on-investment than peers (16% versus 12% CFROI). Their firms are growing a lot faster (12.6% versus 4.4% sales growth, 12% versus 9.6% earnings growth) than their peers, but cost only a little bit more (17.5 p/e versus 17.2 p/e). The fund tends to be a bit more volatile but a lot more profitable than its peers. Several structural aspects of the portfolio contribute to the asymmetry: they rebalance frequently to trim winners; they have a one-in-one-out discipline which means they’re constantly pressured to eliminate their weakest names; they limit position size, avoid debt-ridden firms and invest in areas that are strongly buoyant. That is, the firms are involved in areas where there is a huge long-term impetus which allows them to recover quickly from short-term setbacks. While we need to mechanically and truthfully repeat the “past performance is not indicative of future results” mantra, Global Innovator’s premise and record might give us some pause. Its strategy is grounded in a serious and sustained line of academic research. Its discipline is pursued by few others. Its results have been consistent across 20 years and three sets of managers. This is not a low volatility strategy, but it has proven to be a highly resilient one. Over the past decade, its maximum drawdown was slightly higher than its peers (50.1% versus 47.6%) but its rebound was far faster and stronger. Investors willing to tolerate the slightly-elevated volatility of a fully invested, modestly pricey equity portfolio, Global Innovators really does command careful attention. GA Global Innovators Fund. While you’re there, please do read the Innovation Matters (2018) whitepaper. Written by president Jim Atkinson and analyst Joshua Cole, it’s short, clear and does a nice job of walking you through both the academic research and the firms’ approach. There were more than 57 funds that modified their management teams this month; the “more than” reflects the fact that one manager was pulled off literally uncounted Global X funds. While few of the changes are immediately consequential, several signal an impending changing of the guard. John B Walthausen, now in his 70s, has added a co-manager to the two Walthausen funds. Billy Hwan is joining Jerome L Dodson, also in his 70s, as co-manager of Parnassus Endeavor. 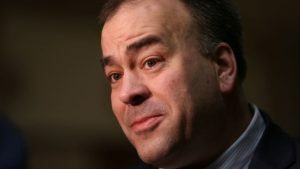 Moving in the opposite direction, Thomas Marsico is moving to pick up responsibility for another fund, Marsico Flexible Capital, after several rocky years. The SEC requires advisers to give them 75 days to review and comment upon any proposed new fund offering. During those 75 days, the advisers aren’t permitted to say anything about the funds except “please refer to our public filing with the SEC.” This month there are 17 no-load retail funds and actively managed ETFs in the pipeline. I’m most intrigued by two funds that aren’t actually new: Seven Canyons Strategic Income and Seven Canyons World Innovators are the rechristened versions of two Wasatch funds, both managed by Wasatch founder Samuel Stewart. Mr. Stewart, now 75, appears to be distancing himself from the firm, though we don’t know the circumstances behind it. The Wasatch website, including Mr. Stewart’s most recent shareholder letter, offers no hints concerning the change. Wasatch has seen steady outflows every quarter since Q2 2014, with a net outflow of around $5.5 billion. One could imagine the departure of these funds, and the merger of Wasatch Long/Short into Wasatch Global Value (see this month’s “Briefly Noted” for details), as attempts to adjust to that reality. AdvisorShares Dorsey Wright Micro-Cap ETF (DWMC), an actively-managed ETF, will seek long term capital appreciation. The portfolio strategy is “entirely based on market movement of the securities and there is no company fundamental data involved in the analysis.” The fund will be managed by John G. Lewis of Dorsey, Wright & Associates.The initial expense ratio is not yet disclosed and, being an ETF, there is no minimum initial investment. Agility Shares Managed Risk Equity ETF (TRCE) seeks income and long-term growth with a secondary goal of limiting risk during unfavorable market conditions. . The plan is to invest in some combination of S&P 500 Index futures contracts, S&P 500 ETFs and S&P 500 stocks. “The Fund buys and sells put options against these positions to offset the risk of adverse price movements, and buys and writes call options against the same positions to reduce volatility and to receive income from written call options.” The fund will be managed by Phillip Toews, Randall Schroeder, Jason Graffius, and Charles Collins, all of Toews Corporation. The team manages five other funds, four of which have two star ratings from Morningstar. The initial expense ratio is 1.05% after waivers, and there is no minimum initial investment. AI Powered International Equity ETF, an actively though robotically managed fund, will seek capital appreciation. The manager relies on an artificial intelligence program, EquBot, running on IBM’s famous Watson platform. The program identifies both the international equity securities and their target weights, based on a 12-month risk/return horizon. Anticipate an all-cap portfolio of 80-250 names with the prospect for relatively active trading. Two mere humans, Denise M. Krisko and Rafael Zayas of Vident Investment Advisory, make the actual buy/sell decisions. For now! (Insert a mechanical “mwah-hah-ha” about here.) The initial expense ratio is not yet disclosed and, being an ETF, there is no minimum initial investment. Altegris/AACA Real Estate Income Fund seeks to maximize current income with potential for capital appreciation. The plan is to invest in the equity and debt of U.S., foreign and emerging market real estate and real estate related companies. The fund will be managed by Burland B. East III of American Assets Capital Advisers, LLC. Mr. East also manages the five-star Altegris/AACA Opportunistic Real Estate Fund (RAANX). The initial expense ratio has not been disclosed, and the minimum initial investment for the no-load “N” shares will be $2,500. AlphaCentric Small Cap Alpha Fund seeks long-term growth of capital. The plan is to invest in the stock of small capitalization companies with “underappreciated earnings potential and reasonable valuations.” The fund will be managed by Mike Ashton of Pacific View Asset Management, LLC. The initial expense ratio for the no-load “I” shares is 1.40%, and the minimum initial investment will be $2,500. AMG TimesSquare Global Small Cap Fund will seek to long-term capital appreciation. The plan is to construct a global small cap portfolio, with a minimum of 30-35% in the US, using fundamental analysis and applying “a macro overlay to monitor and mitigate country risks.” The fund will be managed by Magnus Larsson, Grant R. Babyak and Ian Anthony Rosenthal, all of TimesSquare Capital Management. Mr. Larsson co-manages the five-star AMG TimesSquare International SmallCap Fund (TQTIX). The initial expense ratio will be 1.40%, and the minimum initial investment for “N” shares will be$2,000. Direxion Tactical Large Cap Equity Strategy Fund will seek capital appreciation. The plan starts with a directional trading model created by ProfitScore Capital Management. The model determines, each day, whether the likely direction of the market is up, down or sideways. The managers then (primarily) use index futures to position the fund long, short or neutral (i.e., in cash). The fund will be managed by Paul Brigandi and Tony Ng of Rafferty Asset Management. The initial expense ratio will be 1.45%, and the minimum initial investment will be$25,000. Fidelity High Yield Factor ETF, an actively-managed ETF, will seek a high level of income. The fund may also seek capital appreciation. The fund will rely on “a proprietary multifactor quantitative model to systematically screen over 1,000 bonds and select those with strong return potential and low probability of default using a value and quality factor-based methodology.” It is “guided by” the ICE BofAML BB-B US High Yield Constrained Index (wow) but might invest in non-US bonds, in higher or lower quality bonds and in the bonds of “troubled” companies. It will be managed by Michael Cheng, Matthew Conti and Michael Weaver. The initial expense ratio is not yet disclosed and, being an ETF, there is no minimum initial investment. First Trust TCW Unconstrained Plus Bond ETF will seek to maximize long-term total return. The plan is to invest in fixed income securities of any type or credit quality, including up to 70% in high yield (or “junk”) securities, up to 60% in emerging market securities and up to 50% in securities denominated in foreign currencies.. The fund will be managed by Tad Rivelle, Chief Investment Officer of the Fixed Income Group at TCW, Stephen M. Kane, Laird Landmann, and Brian T. Whalen. Mr. Rivelle is reasonably famous, as least so far as fixed-income fund guys get to be famous. The initial expense ratio is not yet disclosed and, being an ETF, there is no minimum initial investment. Franklin Liberty High Yield Corporate ETF seeks high level of current income, with some capital appreciation as long as it doesn’t conflict with the “current income” goal. The plan is to invest in high yield securities, with the portfolio constructed security by security from the bottom up. The fund will be managed by Glenn I. Voyles and Patricia O’Connor, both of Franklin Advisers. The duo co-manages Templeton Global High Yield, an undistinguished UCITS, with Michael Hasenstab. The initial expense ratio is not yet disclosed and, being an ETF, there is no minimum initial investment. Gadsden Dynamic Equity ETF seeks total return with both reduced downside risk and sensitivity to inflation. The plan is to construct a portfolio with two embedded components. The strategic component, typically about 80% of the portfolio, is a global equities portfolio. The tactical component takes “a shorter-term view of market opportunities and downside threats,” the allocation to which is “designed to adjust overall portfolio risk either higher or lower, depending on market conditions and opportunities.” The fund will be managed by Kevin R. Harper and James W. Judge, both of Gadsden, LLC. The initial expense ratio is not yet disclosed and, being an ETF, there is no minimum initial investment. Gadsden Dynamic Income ETF seeks current income while providing a positive long-term real return. The plan is to construct a portfolio with two embedded components. The strategic component, typically about 80% of the portfolio, is a mix of fixed income securities and high dividend yielding global equities. The tactical component may “invest globally in any asset class” and takes “a shorter-term view of market opportunities and downside threats,” the allocation to which is “designed to adjust overall portfolio risk either higher or lower, depending on market conditions and opportunities.” The fund will be managed by Kevin R. Harper and James W. Judge, both of Gadsden, LLC. The initial expense ratio is not yet disclosed and, being an ETF, there is no minimum initial investment. Gadsden Dynamic Multi-Asset ETF seeks to preserve and grow capital with a positive long-term real return. The plan is to construct a portfolio with two embedded components. The strategic component, typically about 80% of the portfolio, will balance lower-risk asset classes (such as inflation-linked bonds or fixed income securities) and higher-risk asset classes (such as equities or REIT investments). The tactical component takes “a shorter-term view of market opportunities and downside threats,” the allocation to which is “designed to adjust overall portfolio risk either higher or lower, depending on market conditions and opportunities.” The fund will be managed by Kevin R. Harper and James W. Judge, both of Gadsden, LLC. The initial expense ratio is not yet disclosed and, being an ETF, there is no minimum initial investment. Harbor Core Bond Fund seeks total return. The plan is to invest in domestic, investment-grade fixed-income securities. The fund will be managed by William A. O’Malley, James E. Gubitosi and Sarah Kilpatrick, all employees of Income Research + Management. In 2017, Pensions & Investments named them the second best place to work among all smaller (100-500 employee) investment management firms. Messrs. O’Malley and Gubitosi are about CFA charterholders. The initial expense ratio for Institutional shares is 0.45%, and the minimum initial investment will be$1,000. Seven Canyons Strategic Income Fund will seek current income, with a willingness to accept some long-term growth of capital. The plan is to invest in a global equity and fixed income portfolio, though the allocation between asset classes is fluid. This is the rechristened incarnation of Wasatch Strategic Income Fund (WASIX). Technically, “The Fund commenced upon the reorganization of the Wasatch Strategic Income Fund.” The manager is Samuel Stewart, the 75-year-old founder of the Wasatch Funds. The initial expense ratio has not been disclosed and the minimum initial investment will be $1,000, unless you’re silly enough to fund an IRA. In that case, the minimum increases to $2,000. That’s a provision I’ve never before encountered and I’ve chronicled thousands of funds in registration. Seven Canyons World Innovators Fund will seek seeks to deliver capital preservation and capital appreciation. The plan is to invest in domestic and foreign growth companies that the Adviser believes are innovators in their respective sectors or industries. This is the rechristened incarnation of the five-star, $200 million Wasatch World Innovators Fund (WAGTX). The managers are Samuel Stewart, the 75-year-old founder of the Wasatch Funds and Josh Stewart, who have also been managing the Wasatch fund. The initial expense ratio has not been disclosed and the minimum initial investment will be $1,000, unless you’re silly enough to fund an IRA. In that case, the minimum increases to $2,000. Templeton International Climate Change Fund will seek total return over the longer term. The plan is to invest predominantly in companies that are superior in identifying, adapting and providing solutions to the consequences of climate change (i.e., companies able to successfully transition to a lower carbon economy). The discipline is bottom-up and valued-oriented. The fund will be managed by Maarten Bloemen. The initial expense ratio for no-load “R” shares is 1.47% and the minimum initial investment is $1,000. KCM Macro Trends Fund (KCMTX) received recognition of the best five-year performance among all alternative global macro funds. AQR Multi-Strategy Alternatives (ASANX) led the alternative multi-strategy group. I mention that in recognition of the fact that AQR seems remarkably successful across a range of such funds, none of which particularly welcome smaller investors. City National Rochdale Emerging Markets (RIMIX) led among EM funds. Polaris Global Value Fund (PGVFX) received the award for global multi-cap value fund. Edgewood Growth topped the five year large-cap growth rankings while LSV Value Equity (LSVEX) was tops in large-cap value. Our profiles of them are too old to be worth linking for you, but we’ll check during April to see if we might offer updated profiles. 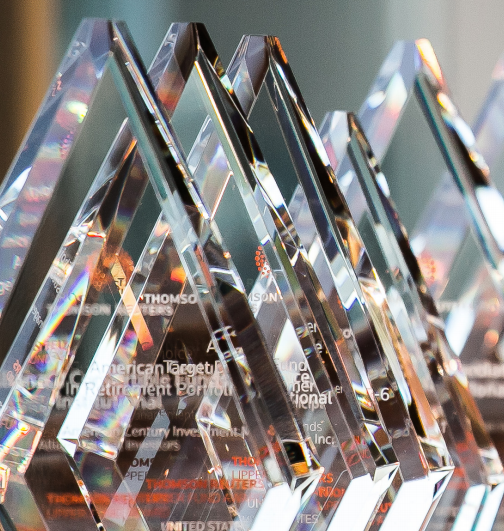 Broadly speaking, T. Rowe Price dominated the target-date retirement categories, in some cases winning the three-, five- and ten-year awards. TIAA-CREF made a strong showing, with Fidelity and Vanguard pretty much shut out. For multi-cap core funds, Parnassus Endeavor ran the table, winning the three-, five- and ten-year awards. Love the fund, worry about manager Dodson’s age. And Oberweis International Opportunities (OBOIX) was the top international small- to mid-cap growth fund over the past 10 years. Aberdeen seems to have taken a dislike to the Okies: “Class T shares are not currently available for purchase and not currently sold in any State or to residents of any State, including Oklahoma or to residents of Oklahoma.” Hmmm … perhaps they were afraid that the Oklahomans wouldn’t have figured it out otherwise? On March 26, 2018, the $140 million Cambria Shareholder Yield ETF (SYLD) gave up its identity as an actively managed quant ETF and became a passively managed index fund tracking the Shareholder Yield index. No decrease in fees accompanied the change. On April 6, 2018, Direxion Monthly S&P 500® Bull 2x Fund (DXSLX) and Direxion Monthly Nasdaq-100® Bull 2x Fund (DXQLX) will each undergo 5:1 share splits; for every share you own on April 5, you’ll have five on April 7. Since the NAV per share will be precisely one-fifth as high, investors will neither gain nor lose value from the split. I originally thought that PIMCO had updated the “glide path,” that is, the changes in their retirement funds’ asset allocation strategy, effective at the end of March, 2018. It actually appears that they’re just updated the picture of the glide path, to the one above from the one below. Hmmm … well, let’s look at the differences. 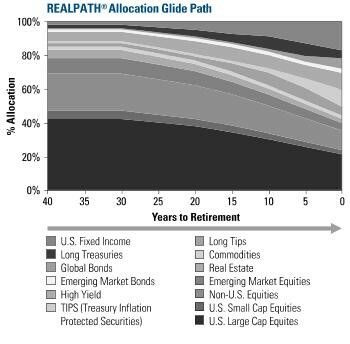 (1) The new asset allocation glide path has the legend on the left, rather than underneath. And (2) the new glide path is higher res than the old one. Especially in the face of increasingly unstable markets, many folks have been asking how much equity exposure they should have. PIMCO’s answer is, “it depends.” In particular it depends on how close you are to actually needing some of the money and how the markets are priced. Here’s the short version of their asset allocation guide. What might you take away from these ranges? A 10-year time frame is when you need to move decisively from the “stocks for the long term” mantra. At the 10 year threshold, the weighting on stocks and the potential overweighting of them drop dramatically. PIMCO’s maximum conceivable stock exposure at the 20 year window is 80%; at the 10 year window, it’s 60%. Why? Because it can take more than 10 years to recover from a bear market. Possibly much more. At this moment, there are 44 funds still in the red 10 years after the 2007-09 crash. An additional 47 funds took 10 years or more (that is, 120 – 122 months) to reach the break-even point. At person who is 58 years old today – that is, a person 10 years from full Social Security benefits – whose retirement is almost entirely equities, is at risk of having a portfolio in 2028 that’s no bigger than it is today. Few of us can afford a lost decade. Want to check yourself? Easy if you have MFO Premium access (and you should, it’s ridiculously affordable at $100 and you’d be helping keep the lights on here). On the multi-screener, go to the “asset sub type” tab and click “US equity, global equity, international equity and mixed asset.” On the “display period” tab, pick “full cycle 5 – 200711-201802”) and on “period metrics” choose “longest recovery time.” You can sort the resulting tab by “recovery months” (or anything else, for that matter) or you can download it as a spreadsheet. Real assets are a hedge against inflation, but are famously volatile. Shorter-term portfolios should contain little or none of them, presumably since the potential losses from rising prices are smaller than the potential losses in a volatile asset class. For additional details on the whole “get your asset allocation right or else” thing, you might review the data from T. Rowe Price that we’ve periodically provided in our essays on a stock-light portfolio. FMI International Fund (FMIJX / FMIYX) will reopen to new investors on April 2, 2018. On March 30, 2018, Gator Focus Fund (GFFAX / GFFIX) redesignated its Investor shares as Institutional shares, and then dropped the minimum initial investment from $100,000 down to $5,000. The new institutional shares serve as a sort of universal share class for the fund, and do not impose 12b-1 fees. Nice people. $3 million fund. Disastrous performance. Vanguard Wellington Fund (VWELX) has closed to all prospective financial advisory, institutional, and intermediary clients (other than clients who invest through a Vanguard brokerage account). Effective April 6, 2018, AllianzGI Small-Cap Blend Fund (AZBAX) will change its name from AllianzGI Small-Cap Fund. American Century Adaptive All Cap Fund (ACMNX) will be renamed the Adaptive Small Cap Fund, effective May 7, 2018. Effective immediately, the name of the BlueStar TA-BIGITech Israel Technology ETF (ITEQ) is changed to the BlueStar Israel Technology ETF. The former Collins Long/Short Credit Fund is now CrossingBridge Long/Short Credit Fund (CLCAX). The fund just received its first Morningstar rating, which placed it as a four-star fund in the long-short credit group. Notwithstanding, Morningstar’s new quantitative rating system (see this month’s “Morningstar Minute” article for details) places a negative rating on the fund for perceived weaknesses in its People, Parent and Price pillars. On the fund’s profile page, Morningstar shows 53 funds in its peer group, up from 50 at the end of 2017, but you get that number only by counting each share class (A, C, advisor, retirement, institutional and so on) of each fund as a separate fund. In reality, there are only 16 “distinct” funds in the group. Fidelity Strategic Income (FSICX) is reorganizing into Fidelity Advisor Strategic Income (FSRIX), effective April 27, 2018. The Advisor version is several hundred million dollars larger and several basis points costlier, but it’s otherwise the same fund. The 10 year correlation between the two is 100. The Board of Trustees at GMO approved a change in the name of GMO U.S. Equity Allocation Series Fund (GMUEX) to GMO U.S. Equity Series Fund, but didn’t stipulate a date for the change. The fund’s investment minimums range from $10 million to $750 million, so relatively few of us will be waiting anxiously to learn the date. After the close of the markets on April 6, 2018, the Guggenheim ETFs all become PowerShares ETFs. On or about April 30, 2018, MarketGrader 100 Enhanced Index Fund (KHMIX) becomes MarketGrader 100 Enhanced Fund. The fund appears to have suffered an “oops,” and is down 17% YTD as of late March. The advisor’s website is curiously silent on the collapse illustrated above. That, all by itself, seems a valid reason to avoid the fund. Effective May 1, 2018, Neuberger Berman Socially Responsive Fund (NBSRX) will change to Neuberger Berman Sustainable Equity Fund. The investment strategy will reorient to focus on mid- and large-cap stocks which survive ESG and valuation screens. As of March 22, 2018, USCA Shield Fund (SHLDX) was renamed USCA Premium Buy-Write Fund. As of April 28, 2018, Strategic Advisers International II Fund (FUSIX) will be renamed Strategic Advisers Fidelity®International Fund. The adviser is contractually obligated to limit expenses to 0.85%, 0.60%, and 0.85% for Class A, Class I, and Class T, respectively, through March 1, 2019. Effective March 1, 2019, the adviser is contractually obligated to limit expenses to 0.90%, 065% and 0.90% for Class A, Class I, and Class T shares, respectively through March 1, 2020. American Independence U.S. Inflation-Protected Fund (FFIHX, FNIHX, FCIHX, and/or AIIPX) is merging into BNP Paribas AM U.S. Inflation-Linked Bond Fund (“BNP TIPS Fund”). Both funds are run by the same management team. The $3 million AMG Chicago Equity Partners Small Cap Value Fund (CESVX) has closed to new investment and will liquidate on May 18, 2018. Amplify YieldShares Oil-Hedged MLP Income ETF (AMLX) will liquidate after the close of business on April 19, 2018.The fund has been around nine months and has lost about 25%. Cavanal Hill Intermediate Tax-Free Bond Fund (the “Fund”) goes to a far, far better place on May 30, 2018. The Trustees of Context Capital Funds have voted to liquidate and terminate Context Strategic Global Equity Fund (CGPGX) effective on or about March 29, 2018 which is to say, it’s gone already. CRM International Opportunity Fund (CRMIX) will liquidate on April 30, 2018. The Direxion iBillionaire Index ETF (IBLN) will close on April 6, 2018 and be liquidated within a week. At base, the ETF tried to invest in the same stocks that the 10 most successful billionaire investors or institutional investment managers invested in. Nice idea but the fund only outperformed the average large cap domestic equity fund by 100 bps over the course of three years, an amount insufficient to draw the attention of any billionaire investors, or millionaire investors or, judging from the AUM, even more thousandaire investors. Fidelity is giving up the ghost on Fidelity Inflation-Protected Bond Fund (FINPX). The fund will be merged in Fidelity Inflation-Protected Bond Index Fund (FSIQX) on or about August 24, 2018. Neither fund is spectacular, but the index fund has nearly twice the assets at about half the cost which accounts for most of its slight performance advantage over FINPX. William Irving no longer serves as lead portfolio manager of the fund. Hartford Global Equity Income Fund (HLEAX) is slated to merge into Hartford International Equity Fund (HDVAX) on or about June 25, 2018. The Global fund owns about $65 million in US stocks and is merging into a fund with just $70 million in assets; that implies a lot of liquidations and, potentially, a large tax bill for someone. Janus liquidated and terminated Janus Velocity Volatility Hedged Large Cap ETF (SPXH) and Janus Velocity Tail Risk Hedged Large Cap ETF (TRSK) on March 26, 2018. Johnson Growth Fund (JGRWX) is merging into the Johnson Equity Income Fund (JEQIX) on or about April 20, 2018. What’s the rush? JPMorgan Multi-Cap Market Neutral Fund (OGNAX) liquidated on March 23, 2018. That date was moved up twice, from April 6 to March 29, then to March 23. Lazard US Realty Income Portfolio (LRIOX) will, pending shareholder approval, merge into Lazard US Realty Equity Portfolio (LREOX) on or about June 29, 2018. The funds, between them, have $70 million in assets. Over the past two years, LREOX has had much stronger performance than LRIOX, but they did spend their first seven years neck-and-neck. They’re run by the same two managers, which raises the question of whether LREOX’s recent excellence represents brilliant management or just (temporarily) favorable market conditions. Lord Abbett Multi-Asset Focused Growth Fund (LDSAX) will merge, at a not-yet-specified moment, into Lord Abbett Multi-Asset Growth Fund (LWSAX). Those affected by the move should note that LWSAX has a substantial bond component (17%) and about a third fewer international stocks than does the disappearing fund. That has translated to higher returns with higher volatility. MFG Low Carbon Global Fund (MGKGX) and MFG Infrastructure Fund (MGKSX) will liquidate on or about April 27, 2018. A proposal to merge Nuveen Concentrated Core Fund (NCADX) into Nuveen Large Cap Core Fund (NLACX) will be submitted to shareholders in May. The funds have the same managers, are the same age and have comparable expenses. Concentrated holds 20 stocks, Core holds 100. Core has higher returns and lower volatility but neither is particularly a star. Nuveen Symphony High Yield Bond Fund (NSYAX) will be liquidated after the close of business on May 11, 2018. Solid fund, victim of the whims of the market, I suspect. Putnam Investors Fund (PINVX) will close on May 18, 2018 and merge into Putnam Multi-Cap Core Fund (PMYAX), likely on June 25, 2018. Huh? Putnam Investors launched in 1925 and has over $2 billion in assets, about three times the size of Multi-Cap Core. Statistically, the funds have nearly identical performance over the past five years though that seems like an awfully thin slice of data when you’re dealing with one fund that has a 93 year record. The correlation between the two is 99 and the statistical differences between the two are typically a tenth of a percent. Both have a four-star rating from Morningstar and have the same managers. The only consequential difference is that Investor tends to hold more large-cap names. While they’re at it, Putnam is merging Putnam Capital Opportunities Fund (PCOAX) into Putnam Small Cap Growth Fund (PNSAX) and liquidating entirely Putnam Low Volatility Equity Fund on or about May 18, 2018. Shelton European Growth & Income Fund (EUGIX) and Shelton Greater China Fund (SGCFX) are both fated to be eaten by Shelton International Select Equity Fund (SISLX). The two regional funds each has fewer than $10 million in assets. TCW Focused Equities Fund (TGFVX) will liquidate on or about May 31, 2018. 2008 served as a turning point in the fund’s history; it performed excellently before the crash and miserably thereafter. Templeton Global Opportunities Trust (TEGOX) is merging into Templeton Growth Fund (TEPLX) or about August 24, 2018. At about the same time, Templeton Foreign Smaller Companies Fund (FINEX) will merge into Templeton Global Smaller Companies Fund (TEMGX). The merger of the Third Avenue International Value Fund (TAVIX/TVIVX) into the Third Avenue Value Fund (TAVFX/TVFVX) was completed on March 19, 2018. Pending shareholder approval, Thrivent Growth and Income Plus Fund (TEIAX) will merge into Thrivent Moderately Aggressive Allocation Fund (TMAAX) sometime this year, the filing was not particularly informative on the subject. The move is a good one for shareholders. On or about April 27, 2018, Virtus Duff & Phelps International Equity Fund (VIEAX), Virtus Horizon International Wealth Masters Fund (VIWAX), Virtus Rampart Global Equity Trend Fund (VGPAX) and Virtus Rampart Low Volatility Equity Fund (VLVAX) will be liquidated. Subject to various sets of shareholder approvals, Voya Multi-Manager Large Cap Core Portfolio (IPFAX) will merge into Voya Index Plus LargeCap Portfolio (IPLSX) in September. The Board of the Wasatch Funds Trust has decided to put Wasatch Long/Short Fund (FMLSX – who now remembers the 1st Source Monogram funds whose legacy lived in this ticker symbol?) out of its misery by merging it into Wasatch Global Value Fund (FMIEX – notice the odd coincidence in the ticker, this used to be 1st Source Monogram Income Equity Fund). Wasatch adopted both funds in 2008, assets in long/short popped from $100 million to $1.6 billion in three years, Wasatch replaced its 1st Source managers in 2013 and the fund promptly lost money in three of the next four calendar years. It’s now smaller than when Wasatch purchased it.